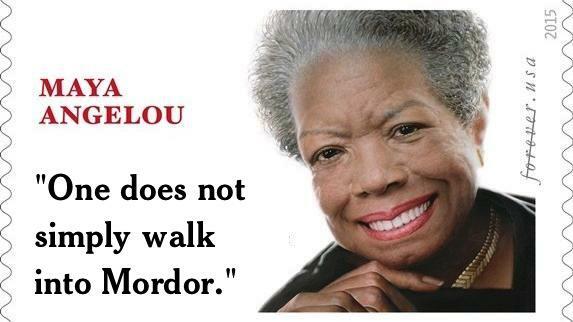 I understand how the wrong quote ended up on the Maya Angelou postage stamp, I really do. Poetry isn’t my thing, I’ve never read her work, and I might have made the same mistake. What I can’t comprehend is why doing right by this preeminent poet is so hard. One does not have to appreciate poetry to understand that a writer who deserves her own stamp deserves her own work on that stamp. One does not have to be a woman to wonder if the United States Postal Service would allow this mistake to turn into disrespect if she were a man. One does not have to be a person of color to wonder why, when we are trying so hard to recognize that not everyone who has done amazing things in this country was white, we can’t take the time, and spend the money, to reissue this stamp. It can be with a quote of Angelou’s, or at the very least, with proper credit for Joan Walsh Anglund, whose line of poetry, “A bird doesn’t sing because it has an answer, it sings because it has a song, ” has apparently been misattributed to Angelou for years. Therefore, I did something about it, but it won’t be worth much unless I can get a hundred thousand like-minded individuals to help by signing the petition that calls for this mistake to be fixed. Because making mistake is human, but coming up with excuses not to make it right is just pathetic. Please sign, share, reblog, and put up a stink. Thank you. AIG should follow through with its badly-negotiated contracts, and should do so without using one dime of the bailout money. The roots of our economic crisis are actually really, really complicated; we’ve learned to do things with money that are so dizzying that we really have no idea what’s going to happen next. It comes from the belief that since we invented the stuff, we must understand that laws it behaves under. I’m looking fnordward to seeing how that theory turns out, but in the meantime we’re stuck sorting through a hip-deep pool of securitized instruments that’s had a slew of interesting derivatives poured into the mess. The reason why you should never invest in something you don’t understand is because if you don’t understand it, someone is going to increase their own profit with your ignorance. These complicated financial instruments were created because someone found an obscure loophole or a clever sales pitch and manufactured something that would make money hand over fist – but that clever person never spelled out whose hand, and which fist. For all the money you hear about the securitization industry making by slicing and bundling mortages into investment vehicles, you can be sure that lots more got made in ways that none of us really understand yet. If it’s complicated, it was designed that way to obfuscate its true purpose. Luckily for us, not everything in the recovery is going to be as complicated as the downfall. For example, the current flap about the insanely large bonuses given to AIG employees – the same ones that brought the company down? I think the solution to that egregious violation of the public trust is to make AIG pay the bonuses, but with their own money. I wonder how quickly they would backpedal if they had to cough up every cent themselves? It just occurred to me why Commander Adama would sell dog food. He was a cowboy first! Today is Friday the Thirteenth – how wonderful! This is a day that according to Abrahamic tradition is prone to bad luck. Not so much for Pagans, unless they choose to honor the cultural traditions of the majority. There are probably other reasons I can’t think of at the moment, but that’s the gist of it – the intersection of Friday (which we generally think of as joyous in the modern world) and the dreaded number thirteen (avoided by hotels, but honored by coffee manufacturers as the number of ounces in a pound) causes a terrible juxtaposition of ill luck for any who expect it. Watch carefully. Any even slightly inconvenient incident will likely be attributed to the date. If it isn’t, try remarking, “Well, it is Friday the Thirteenth.” No doubt you will get nods of sage agreement. But what I see today is a Friday (yay!) that isn’t blisteringly hot for change (woo!) and is leading up to a weekend where I don’t have to burn much gasoline (praised be Pedestria! ), so it’s a pretty good day from where I sit. If you choose to have a crappy day, enjoy your bad luck – after all, if you really really want bad luck you ought to have fun with it! Otherwise, just enjoy a glorious Friday!